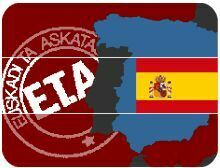 Madrid - The militant Basque separatist group ETA may have established a cell in Madrid, Spanish press reports Tuesday quoted police sources as saying. The cell would be ETA's first based in the capital for about six years. Evidence of the cell emerged when suspected ETA activists planted a car bomb in a Madrid fair and office neighbourhood on Monday. The blast caused material damage, but no injuries. The bomb used in the explosion appeared to have been prepared in Madrid, the daily El Mundo said. The van used in the explosion had also been stolen in the Madrid region shortly before, and the telephone calls giving advance warnings about the blast came from Madrid. The attack was ETA's first in the capital since December 2006, when a car bomb killed two Ecuadorian immigrants at a Barajas airport underground parking lot. The people who staged that attack were thought to have come in from the Basque region or from France.